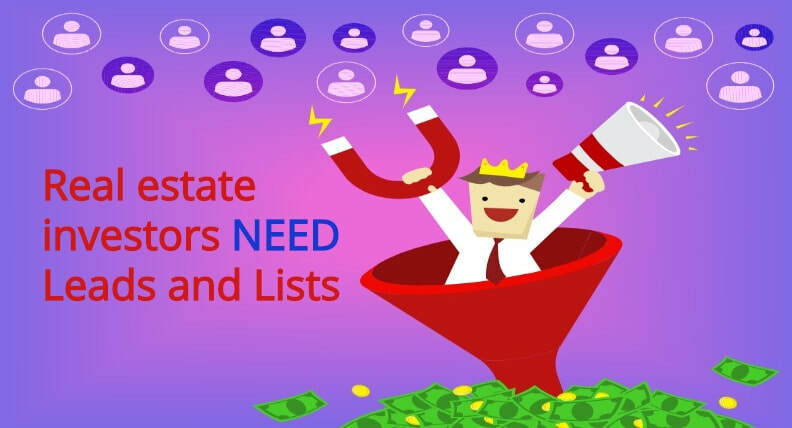 Who should be interested in Lists and Leads? Leads versus Lists - how to choose? The Leads I deliver to you are waiting for your (as my customer), and your business, contact! The List records I deliver to you contain relevant contact information so you, and your business, can reach out and make contact – per record data information varies per product! Also, with List Products I sell - you have the option to include NCOA Data or Skip-Trace Data to improve the reliability of your data set!!!! These contacts that you make (with my Leads or Lists) will allow for your development of a real estate deal!! The difference between Leads and Lists depends on the amount of follow-on work you need to do. Lists requires your marketing dollars and time to perform a contact so an information sheet can be filled-out by you. ​Contrast that with Leads, where I have already done the marketing, established contact with the prospect and provide you with the lead information – handed to you on a silver platter!! Why purchase from DLS Fast REI Leads? ​Because I am a lead generation expert and know how to mine and deliver the highest quality REI Leads and Lists available anywhere; and at reasonable \ fair prices!! My Lead and List products can eliminate or reduce your marketing dollars, headaches and time spent; both for you as an REI business owner and\or your staff!! My Lead and List products can free your time (or your staff) to convert prospects into deals quicker and easier. After all, that is likely why you wanted to pursue REI so you can have more free time? My Lead and List products can help you by allowing you to work more deals; by providing you with great quality motivated sellers, buyers and lenders – you can spend your time constructing deals; the critical revenue producing task and leave the marketing generation to me!! I have access to a huge pool of reliable data sources that I pull your data from. I provide you with high quality Leads and Lists that you can use everyday in your REI business! Don't throw away marketing dollars and ignore the follow-up required for this business – I can solve your marketing headaches with Leads that are ready for you to work a deal!! What differentiates DLS Fast REI Leads in the Leads\Lists marketplace? ​I can provide you with Lead or List products targeted anywhere throughout the USA! I can provide you with Lead or List products across multiple investing niches; in contrast most other Lead or List companies only offer products in one or two niches! Per product, you specify your custom criteria for your search and delivered product features - that fit your business methods and model!! I offer pre-made bundled product offerings OR you can request a custom designed List or Lead product – either based on a pre-made offering OR something entirely different!! For all product questions to help in developing your custom solution, you will work with me directly. - I offer products to solve your marketing issues across each major segment of creating an REI deal: from locating motivated sellers, finding a buyer, securing\using a private lender. - I offer flexible payment methods – online payments using PayPal or credit\debit cards to mailed-in methods such as check, cash, money order. - You can order your products directly on this website; instead most Leads companies require you to fill out a form to initiate contact and then separate from the website, place your order; their method equals a lot of hassle and time wasted! I always provide fast response and delivery for product questions, working with you to create a custom marketing solution, and product delivery – in a courteous and respect driven 100% satisfaction manner! ​As the President \ Owner of DLS Fast REI Leads, I started this business with the concept of providing a vital marketing based service to all REI's. Before launching this business, I worked in corporate America as a Software and Electrical engineer – I have approximately 15 years experience in those fields. In starting this business, I decided to merge my knack for system design and optimization with my passion to help my customers in a direct support role so they can close more REI deals easier and faster! I love working one-on-one with you to establish not only a good relationship but to help you with your marketing challenges by crafting a custom marketing solution for you and your business – in providing you with the vital business life-blood of leads!! I have a range of skills from being detail oriented to systematization of the processes used to deliver a high quality product to you – these skills allow for delivery of my products in the fastest, most efficient and reliable ways!